Recently, Just Cause 4 went gold and now the developers at Avalanche Studios wants fans to know that the studio is working hard on post-launch content. The trailer showing off the DLC expansions reveals that 3 DLC packages are coming. Pack 1: Dare Devils will launch in early 2019 and has an emphasis on destructive racing. That DLC will have Rico participating in various death races and “rampage rallies” in the underground of Solis. 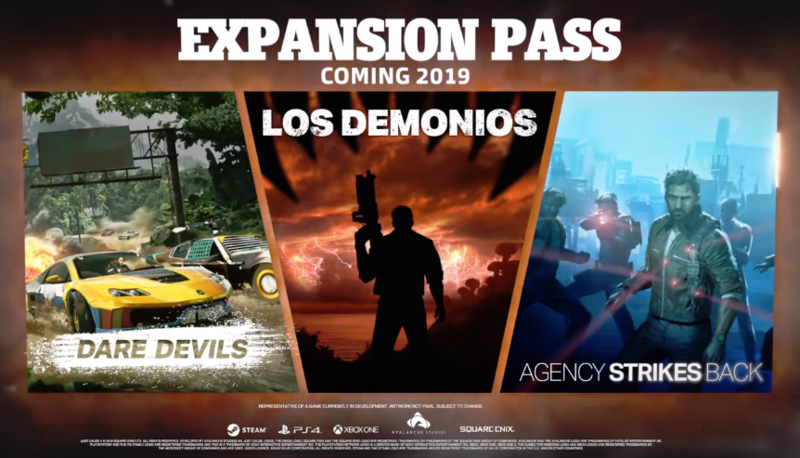 Pack 2: Demons releases in 2019 as well. Is a story-focused expansion that sees Rico taking on a demonic force infecting Solis. Pack 3: Danger doesn't have a launch window. Also known as Agency Strikes Back, this DLC has Rico face new enemies and find new weapons and technology as he fights The Agency, a CIA parody agency that Rico worked for during the events of Just Cause and Just Cause 2. Just Cause 4 launches on December 4th for Xbox One, PS4, and PC.